Now concerning the betrothed, I have no command from the Lord, but I give my judgment as one who by the Lord's mercy is trustworthy. I think that in view of the present distress it is good for a person to remain as he is. In a sense, today's selection is not part of the "Bible" because Paul very clearly gives us to understand that this is advice, not Scripture. It is not the teaching of Paul, the prophet-apostle charged by God to bring Christ to the world, but Paul the man, giving advice to his friends. It is not canonical. Paul never predicted the Day of Judgment, and his talk about time growing short is ambiguous. Did he think that Christ would return in a year, or ten? He never says such, but it is possible to read his epistles as implying that he did. Or was he speaking more generally about the shortness of life, how fleeting our four score years actually are, compared to an earth that is four or five billion years old, and a God to whom the earth's age is just the blink of an eye? Paul is often depicted as against marriage, but it isn't true. At most, he tells people they should not feel pressured to marry, that it is good to be celibate in Christ's service. And the only reason he gives is simply that being single is less troublesome than being married. At the end of this passage, he delves into an odd flight of mysticism, where he urges everyone to live as if Christ were returning in the morning, or next week. To live, that is, as if they were on the verge of passing into the next life. It sounds as if he is describing the attitude of one of the sequestered monastic orders to come in later centuries, where men and women would live without spouses, without goods, without mourning or celebration, in a state of constant worship, taking part in the world only to the degree necessary to keep their bodies alive. 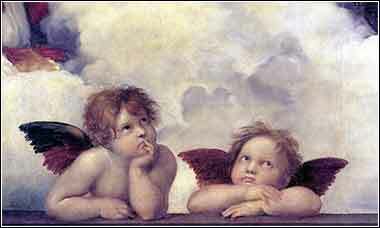 Raphael's famous putti, or cherubs, detail from a painting known as the Sistine Madonna (not part of the Sistine Chapel), c. 1513.